A friend of mine, Amy, recently moved to another country. While I’m sad she’s gone, I know this is a great opportunity for her and her family. She’s been a personal trainer for years and has just expanded her business to include online courses along with nutrition tips. Amy sells a course in her fitness business which includes videos and PDF’s. For every person who purchased her course, she wanted to send a personalized “welcome” letter but didn’t want it coming from an auto-responder. She wanted it to be from her email. For every sale, she sent that person a personalized welcome email. While the sales were great, she quickly realized writing out that (short) email still took time. Amy created a canned response in Gmail, changed the greeting to the name of the recipient, and saved herself a ton of time! Canned responses work great because you can create as many saved responses for any occasion: welcome letters, thank you letters, schedule a meeting with your scheduling link, etc. If your business doesn’t use Gmail, you can still create and save email templates for any purpose. Bonus time-saving tip: this is a task that can easily be outsourced. Each time a sale comes in, have your assistant send these emails out from your email address. Bonus time-saving tip: this is another task that can be outsourced. Provide access to your calendar and have your assistant find a time that works for both parties, put it in your calendar, and sent out invitations on your behalf. It’s easy to feel overpowered by your email inbox. But with these tweaks, you’ll have it under control. 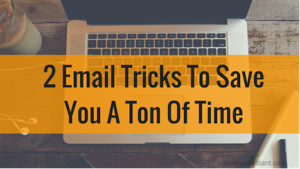 Do you use any tricks to keep your email manageable? If so, please share in the comments.